Designed for strength, ease of operation, and stability, the DF-Capkit ranks among the best of all commercial nuts on the market today. It is based on metric dimensions for connector interfaces. This means that you get 16 mm of outer contact with 7 mm of inner contact for even tighter gripping when you use it. The DF-Capkit was made to fit in with the 7/16 female connector. This means that when you use these two together, your connections are going to be stronger, more stable, and even more reliable over the long haul. In the same way, the dust cap is flexible. This is in the sense that you can make it with a chain or without one. It will all depend on what you are looking for and how you are used to operating your communications channels. Further, the DF-Capkit is made of brass with inbuilt nick plated rubber O-rings. This type of manufacturing means that you should be able to comfortably use this product to protect the coaxial port on your cell site’s antenna for faster reception of signals from the field and beyond. As one of the highest quality connectors on the market today, however, the pricing of the DF-Capkit is on the higher side. This means that you should expect to invest anywhere between $18 and $22 for this connector. Although this pricing might seem expensive, it won’t once you consider the many benefits and features that you will be getting in return. For instance, it comes with an IP68 waterproof rating, giving you greater peace of mind in the knowledge that your product will be protected from adverse weather conditions. If you are looking for a metal dust cap, therefore, you won’t be making a bad choice if you decide to go with the DF-Capkit. 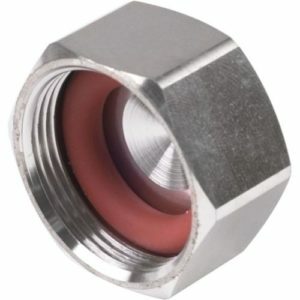 Apart from the description above, you might also want to know that this metal dust cap is one of the best solutions out there for anyone looking to protect their coaxial connector from water and dust when they aren’t in use. To add to the above, you would also be pleased to note that this female DF-Capkit will serve perfectly with your RF connector. It comes with coaxial construction and is made of aluminum alloy for greater durability and easier conduction. In terms of conducting, this is a solid conductor through and through. It also uses air as its dielectric material and is never flooded – not even over Briad. Further, you get 32 Ohm nominal impedance, special jacket material, and a solid aluminum tube tin plating for their screen/shield. Ranked among the best connectors on the marketplace, the DF-Capkit is strong, durable, and water- and air-proof. After tying it up as specified by the manufacturer, you will be able to take advantage of the solid construction, the dependable manufacturing, and the protection this connector provides all the while supplying excellent conduction.